Can you remember developing photos, when you had no idea what you were going to get? We would turn in those little canisters and hope for something wonderful to come back in the envelope. We used to spend a lot of money trying to get a good picture of our son. Capturing Jack on film required expert photography skills combined with the fastest shutter speed and endless rolls of film. It took money and patience and perseverance, and faith, and will, and cooperation and an ability to be spry that most people lose about the age of nine -- and we failed, continuously. We don’t really have those “Kodak moments” in our family, and it’s not for lack of trying. We have been prolific in our clicking so as to produce at least some decent shots over the years, if only by the grace of statistics ... but we cannot truly capture our elusive boy. When we did get a shot, it was never with a straight-on look. It felt like I could never really look at my own son, not since he was an infant, when, as irony often deposits itself into my life, my son demanded constant eye contact or he would fuss and fuss; he was so intense, and I would just stare at him for hours. At some point I gave up trying for a good photo. I couldn’t manage my disappointment. I would race to the store, hand over a wad of twenty-dollar bills and pick up packs of pictures after a weekend trek on the beach. Batch after batch I would comb through them in the car, seeing only the missed moments, or blurry ghosts of Jack, or his eyes, distant and turned away. I began to let go of the idea of ever having a “real” family photo. I stopped trying to take a picture of Jack doing normal every day activities and saved my strength for holiday photos, birthday parties. Worse, I would leave the camera at home completely, feigning forgetfulness, instead of trying to push down my sadness at every click. I tried not to care that frames sat empty, a crushing reminder of my once-upon-a-time dream of handing grandparents a happy smiling print of their first grandson. Scrapbooking, while never my passion, was quickly abandoned. I wanted to not notice other families’ adorned tabletops and hallways, lined with home and school photos, each one a masterpiece, a moment in time framed and hung for all to see. Happy, smiling families on their holiday cards, a hundred of them landing in our mailbox in December, just kicked at my heart. Then we got a digital camera, a nice one. We have a child with autism. Actually, we have a child with autism and cerebral palsy, and some panic issues and some migraine issues and some sleep issues and God only knows what else. And one of his “issues,” or skills, or (dis)abilities, is avoiding a camera lens, or at the very least he won’t tolerate a camera with a person behind it. The reason we had a hard time getting a good picture of Jack wasn’t really about us not trying hard enough, or not caring enough, it was just a part of having this special needs kid. Wanting Jack to look like a kid in those “beautiful family in white cotton sitting in a field” photos is like asking my son not to have autism. 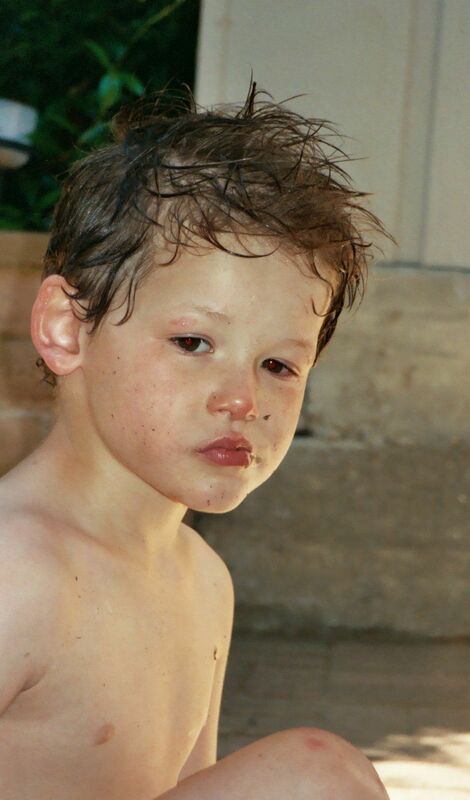 When I saw a “bad” photo, I kept seeing him as the world might see him, or perhaps how he appears in an IEP or an IPP, or any other form that insists I list all of the reasons we are in a doctor’s waiting room instead of at the park. I was hurt and sad all over again, like getting a diagnosis with every frame. And then I realized we would never be able to “capture” Jack. He is the kind of kid who is surprising and variable and continuously changing. He is sneaky, or laughing at his sister, or gobbling half of a chocolate cake. He’s more than all of those disabilities that get in the way of a photograph; he’s my precious, hazel-eyed boy. Under all of those disabilities, he’s our child who is more like us than not. He has our sense of humor, and our love of fine food. He loves to bury himself in a pile of pillows, and snuggle with his family. He likes to sift the sand and watch the blues of Lake Tahoe shimmer in the sun. He is affectionate, and loves to watch Mythbusters with his Dad. He loves a good car trip, and he feels better, just like we do, when we walk along a trail in the midst of natural beauty. 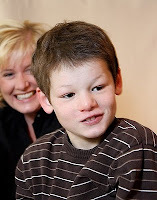 He’s ours, and he happens to have bunch of disabilities ... but he is our child first. We take photos of each other, of events, because we want to mark a moment in time, believing that a single image can remind us of who we were, or who are children were at the time. Great photos capture the essence of the moment, distilling all of the emotions in the air and pasting them down into a flat image. And that’s where it’s hard to see Jack. His autism shows up just fine; he is clearly awkward, not a part of the crowd, he is not “cured," he “has a long way to go.” At a glance people can take in a child in a photo, “Oh, what a bright child,” “What a pretty little girl,” but it takes more than a glance to see Jack. He is in process, continuously moving. He is a child with cerebral palsy stumbling across a crowded room, who somehow manages to avoid prone babies and sick dogs, near missing a fragile elderly person. On the outside he is dirty hands and an unwiped nose, and badly cut hair because he won’t sit still, but inside, he’s the boy who gently grazes your arm to say “hello,” a micro-moment not even superhuman speed could capture through a lens. The camera has no patience to wait for Jack, but we know that all of who he really is, is there beneath, and if we are patient, if we stop expecting the 90 percent of what everyone has, we will see our 10 percent and all of its beauty, just as we must wait until the end of the sentence to hear the brilliance of the stutterer. And it is sometimes painful to be that patient. And I’ll admit, I have not completely abandoned the idea of a family photo. We recently managed to get one that’s pretty decent. I’m lucky because my sister is a photographer, so she spent some time with us in her home studio a few weeks ago. Jack was amazing. He looked at the camera, he smiled, he sat still for moments at a time. He didn’t yell or try to escape. He was precious. We got several beautiful shots of him, photos that capture a bit of that sparkle in his eyes. And you know who was a terror during that photo shoot? His perfect little neuro-typical sister, of course. A version of this essay originally appeared at www.jennyalice.com.